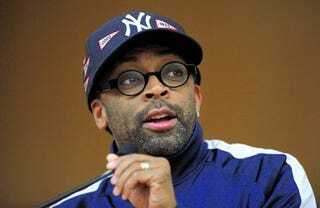 Filmmaker and director Spike Lee went on a profanity-laced tirade this past weekend in which he said that "Hollywood knows nothing about black people." At the Sundance Film Festival, Lee opted not to introduce his much-talked-about movie Red Hook Summer. Filmed in 19 days in Brooklyn, N.Y., it's about a boy from Atlanta who spends the summer with his grandfather in a Brooklyn housing project. But at the end of the screening, in a Q&A, he attacked everyone from Hollywood to Tom Brady to the one-sided population of Utah. Lee began his litany of headline-worthy quotes by saying that he hopes the New York Giants "kick Tom Brady's a— in the Super Bowl." He then moved on to talking about the black population of Utah, or lack thereof, when he said, "Is Brooklyn in the house? We doubled the black population of Utah, maybe tripled it, up in this room!" The black people in the theater where the Q&A was being held included Cuba Gooding Jr., Chris Rock and U.S. Attorney General Eric Holder. But it was a question asked by Rock that set off a tirade aimed at Hollywood: "What would you have done differently if you'd actually gotten a bunch of studio money? What else would have happened? Would you have blown up some s—-?" Lee responded that he'd never gone to the studios for funding and said, "I didn't want to hear no motherf—-ing notes from the studio telling me about what a young 13-year-old boy and girl would do in Red Hook." He continued, "They know nothing about black people. Nothing!" He later apologized for the tirade. The reviews for Red Hook Summer were mixed, with some calling the film the "worst in Sundance history," while others called it the "most powerful" Lee film in years. What do you think of Lee's statement that Hollywood doesn't understand black people?